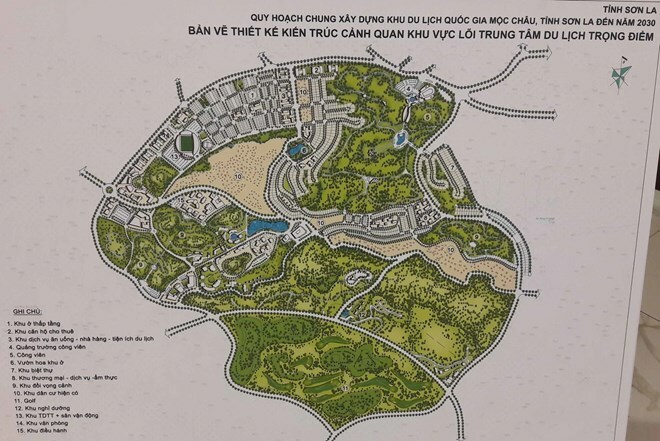 Son La (VNA) – Prime Minister Nguyen Xuan Phuc has issued a decision approving the planning of the Moc Chau national tourist site in the northern mountainous province of Son La by 2030. A conference to announce the PM’s Decision No.128/QD-TTg dated January 25, 2019 was held in Moc Chau district, Son La province, on April 2. Accordingly, the tourist site will cover a total area of 206,150 ha in Moc Chau and Van Ho districts, divided into three zones for resorts, eco-tourism and entertainment activities. The population in the national tourist site is projected to reach about 205,000 by 2020 and 274,500 by 2030. Meanwhile, the number of holidaymakers to the site is set to hit some 1.65 million by 2020 and around 5 million by 2030. The site is expected to have 6,200 rooms by 2020 and about 20,000 rooms in the next decade. Apart from social infrastructure development, Son La is required to promote personnel training in tourism services and high-tech agriculture, while working to improve the local healthcare system and environmental protection. Speaking at the conference, Vice Chairman of the provincial People’s Committee Le Hong Minh said the planning will create the legal foundations for the management of construction investment and tourism development in the locality. It is also a significant step for the socio-economic development strategy of the Northwestern region and Son La province in particular, he added. The planning will help connect Son La with other localities in the region, lure more tourists and investors to the province, and maximise its potential, the official noted. Deputy Minister of Construction Phan Thi My Linh asked Son La to instruct departments, agencies, and People’s Committees of Moc Chau and Van Ho districts to coordinate with relevant ministries and agencies to soon issue management regulations in accordance with the planning.